This month's theme for Foodie Extravaganza is Potato Chips. Karen of Karen's Kitchen Stories chose this theme because March 14th is National Potato Chip Day. 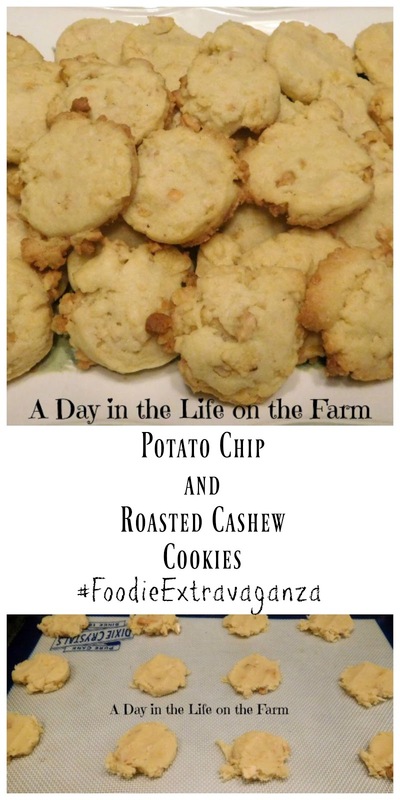 Foodie Extravaganza is a fun little group where we celebrate different Food Holidays. We find these holidays over at The Nibble. It seems like there is a holiday for just about any food you can think of. Karen had no rules other than the dish we create contain or be potato chips. My brother and sister in law come to visit us from California each July. My sister in law travels by train. Last year, during the trip, she came across a recipe for Potato Chip and Cashew cookies, while reading a People Magazine. She had torn it out and saved it for me. I put it in my file and then forgot all about it. That is, I forgot about it until Karen announced the theme for this month. Then I excitedly ran to my, very organized piles of papers that are shoved into a cupboard underneath the shelves that hold all my cookbooks, and dug through them until I found it. This recipe comes from actress, Melissa Peterman. I followed it nearly exactly with the exception of deleting the addition of salt to the recipe. I think that, between the chips and the cashews, there is plenty of salt without adding more. I wasn't sure how I was going to like these cookies and I was surprised how good they were. My great-niece, Lili, really loved them and Frank kept grabbing a couple each time he passed the counter. I also liked that these cookies were quick, easy and only made a couple dozen cookies. This was a good thing because they were just like chips....you couldn't eat just one!! Place butter and sugar in bowl of stand mixer, fitted with paddle attachment. Beat on med high until light and fluffy. Add egg yolk and vanilla, beat to incorporate. Lower the speed and add the flour, half a cup at a time, until incorporated. Stir in the chips and cashews. And yet again, I am reminded that I live with someone who is allergic to nuts! GRRRRRRRR!!! I really do miss them. It's not really that much fun when you have to eat an entire batch of cookies by yourself. Well, it is, but it's not really so great on the diet!!! Yes, allergies are hard but think how much worse it is for him. I wouldn't have thought about coming those ingredients but I'd love to try them. Sounds fabulous, Wendy!! I can't wait to try this. Great minds think alike! And yet...I didn't add cashews, which I love and would be perfect in these cookies! Great idea! I was amazed at how many cookies were shared. I would have never thought to add chips to cookies before this. Isn't it amazing how good potato chips are in cookies? Who knew!! It is amazing. I never would have thought to do this had it not been for the challenge. Mouth melting cookies, I am book marking this recipe. Will try it soon.